This guest blog post comes from Catherine Cerulli, J.D., Ph.D. She was named Director of the Susan B. Anthony Center for Women’s Leadership in September 2012. Cerulli began working at the University in 2002 as assistant professor in the Department of Psychiatry in the School of Medicine and Dentistry. Cerulli served as director of the University’s Laboratory of Interpersonal Violence and Victimization, and had joint appointments as director of research at the Women, Children, and Social Justice Clinic she co-founded in 1992 at State University of New York at Buffalo’s School of Law. It is interesting. The month of October and we see pink ribbons adorning our cars, our shopping bags, even professional football players who don pink socks and gloves to celebrate women and put and end to breast cancer. 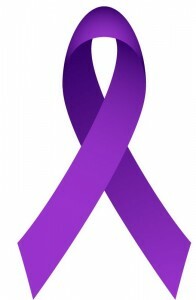 But October is also the host of another color – the color purple for Domestic Violence Month. It is interesting that two such important issues would chose the same month to raise awareness – yet one never sees a pink AND purple ribbon crossed together. We need to begin to open the dialogue about domestic violence. It is rarely in the headlines unless there is a horrific murder or a national bill that is overdue in being renewed. Domestic violence deserves our attention on many levels. We should be talking about it in workplaces, on college campuses, in schools and churches. While the laws may have changed, and televisions shows depict it, the taboo hasn’t lifted. In the wake of a tragic event people often say, “I knew something was wrong, I should have asked her.” Today is your day to ask (credit phillips). Today is your day to ask your boss what your workplace is doing. Today is the day to ask your children’s principal what he or she is doing to help prevent dating violence. And the day to ask a friend. The majority of our efforts and resources go into responding to domestic violence. It is time to focus on preventing it. Education, resources, social support are all great places to begin. If you think someone you love is a victim, help is there. You can call Alternatives for Battered Women or Safe Journey and ask for help. Be sure when you approach your friend or loved one that you have privacy. You need to approach the person experiencing abuse with non-judgmental language and ask an open-ended question such as, “I am concerned about your safety. Is there anything I can do?”. Providing a listening ear matters. Even if your friend doesn’t take the hand you offer, you may have moved her from precontemplation to contemplation – she can’t go back. This entry was posted in Guest Blogger and tagged #anthonycenter, #cerulli, #domesticviolence. Bookmark the permalink.